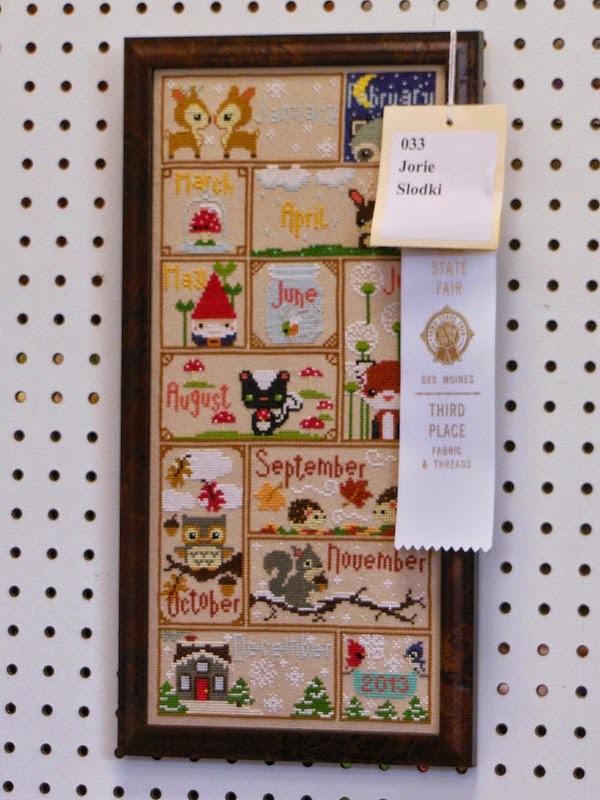 Today Jorie concludes her Summer bloggin' with &Stitches with her second post about her experiences entering embroidery (and other) work to the Iowa State Fair Fabric & Threads competition. 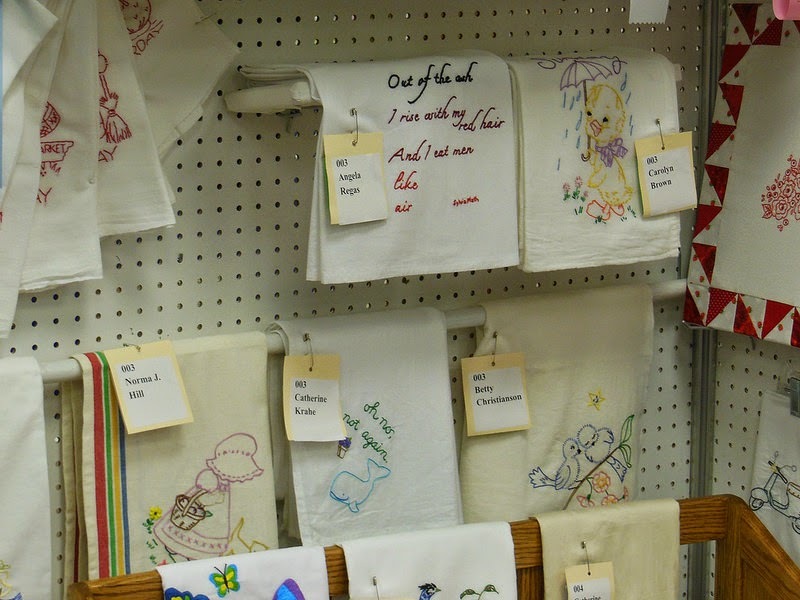 You can follow Jorie on her blog Embroider Elaine. 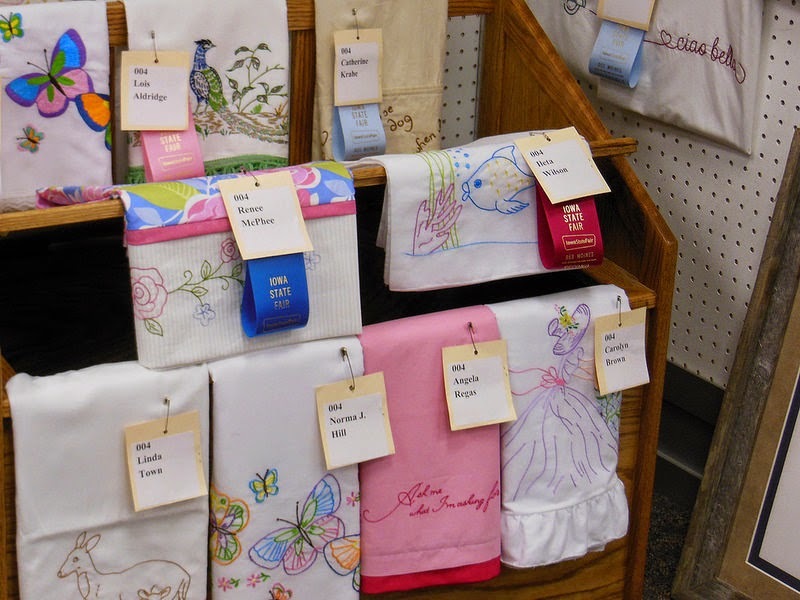 When we last ended, my friends and I had just dropped off our entries to compete in the Fabric & Threads competition at the Iowa State Fair. What were the results? First of all, I did manage to eat a chocolate-chipped cheesecake on a stick, along with other wonderful fried fair foods. Second of all, I’m proud of what I accomplished. 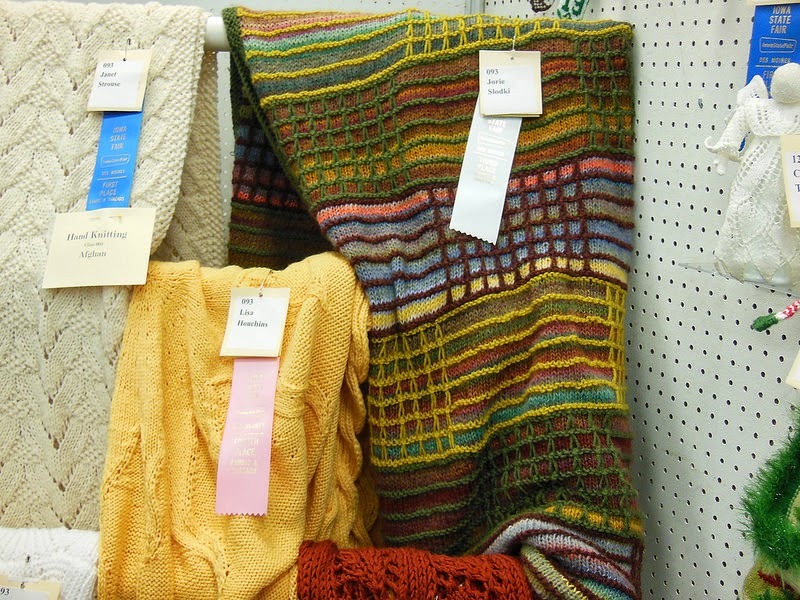 My knitted snip-stitch afghan won a 3rd place ribbon. My Furry Nice Class polar bear did not win any ribbons, but he still looked very adorable and cheerful. 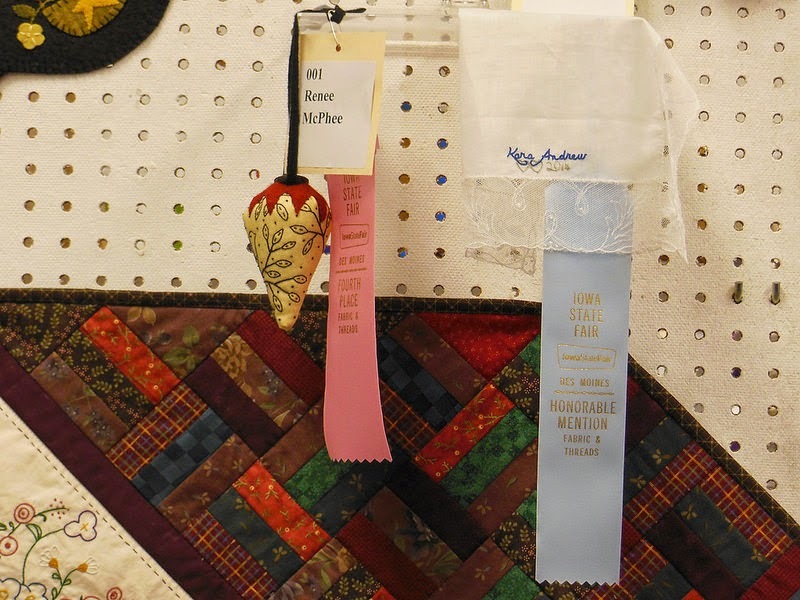 My friends won some honorable mention ribbons for pillowcases and handkerchiefs. The results for all of the competition are available online. On the comment sheets, the judges gave mostly positive comments, such as complimenting the colors I used in my afghan and the shading on my polar bear. The one negative comment was that the frames on my cross-stitch sampler could have been straighter, but the unevenness could have been the result of how it was framed or the natural variations in the linen I used. The change I made in this year’s preparations that made the most difference was simply to enter more items. The polar bear was the only item I made with the intention of entering it, and the other two were ones I decided to enter at the last minute—but those last minute entries ended up winning ribbons. I’m glad I entered these items, and I’d like to enter a higher number of items next year. For $5, I can enter 1 to 10 items, so there is no reason not to enter all the items I can! Regardless of how well our items did, my friends and I are glad we participated in the competition. Angela’s goal was to simply to enter the competition for the first time. She explained, “There are plenty of projects on my list of ‘things I'll make someday,’ so I am proud that I actually followed through with the plan this time. 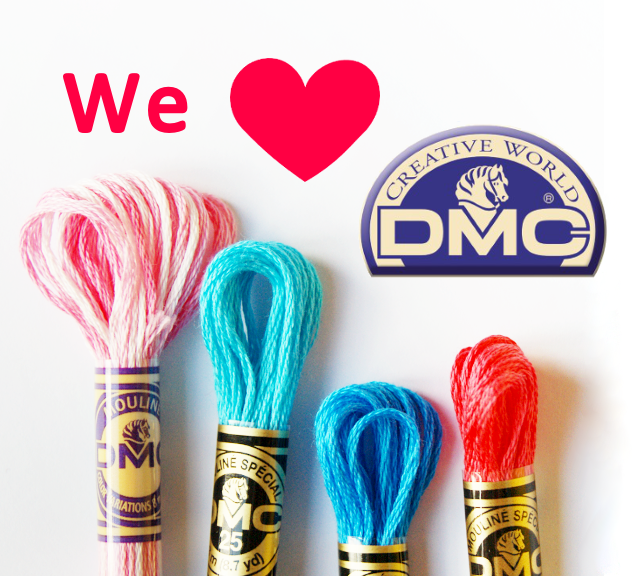 Ultimately, we participate as a way of celebrating our chosen crafts. We walk around the competition and are proud of the work accomplished by our friends. We marvel at the ingenuity and technical prowess of strangers. We see entries that make us want to try new ideas. Not everybody wants or needs to compete, but the State Fair is one outlet that we have found to both bond as a group and to have a goal to work towards. 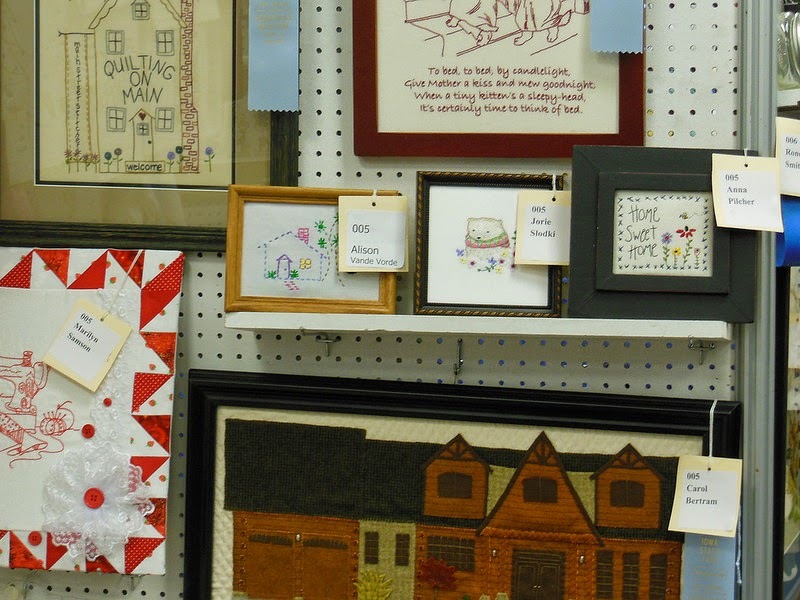 Have you entered your embroidery work in competitions? Share your story with us in the comments. Thank you for two fabulous posts Jorie! Yes, I entered two classes at the local show last weekend and won first and third prize in both. Admittedly, ours is a relatively relaxed and 'young' show (only in its 14th year), with few entries, but it was fun. I too won the highest prizes for pieces I made without entering in mind! This is a good idea! 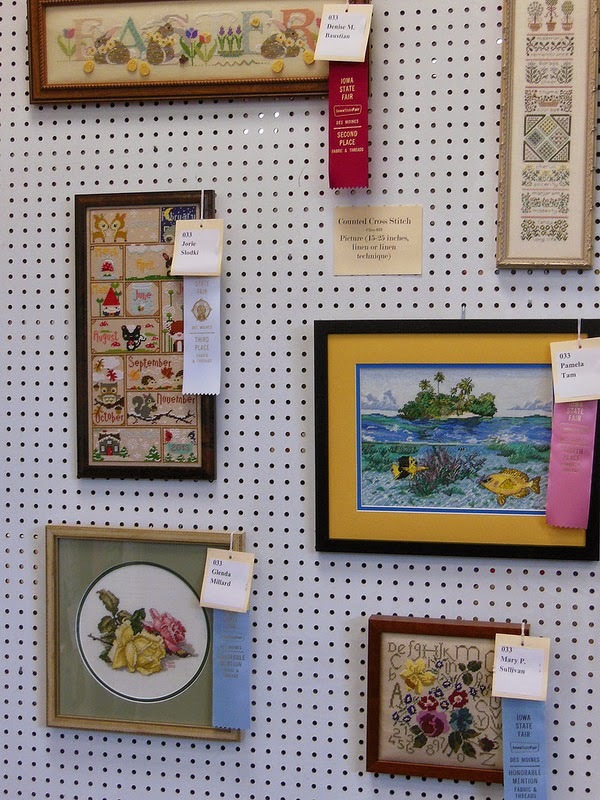 I'll look into entering something next year at our local county fair.